TACLOBAN CITY – The organizers of the Pintados-Kasadyaan twin festivals which remain as one of the most awaited event in the forthcoming feast of the Patron of Leyte, Senor Santo Niño, gave the assurance that the same will be staged again this year. 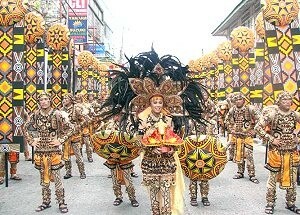 Leyte Governor Carlos Jericho Petilla gave the assurance to the public that can again expect the staging and that the provincial government of Leyte will continue to support the twin festivals as they have already become a tradition in Leyte, the Pintados Festival now in its 24th year and the Kasadyaan now in its 15th year. The organizers led by Palo Mayor-elect Remedios L. Petilla informed that preparations are now being made for this event and they enjoin the public to give their usual involvement and cooperation to make the Pintados-Kasadyaan live on. Various committees have been created in order to ensure that all the activities are given focus. The Executive committee for this year’s Pintados Kasadyaan is composed of Hon. Remedios Petilla and Governor Carlos Jericho Petilla as chair and co-chair; PA Cynthia Nierras, Cong. Bembem Noel, Cong. Neil Montejo, Mr. Eugene Tan, Dr. Evelyn Cruzada and Dir. Karina Rosa Tiopes as members. Also included as Special members of the Executive Committee are, His Excellency Archbishop Jose Palma of the Archdiocese of Palo and this year’s Hermano Mayor, the Agaton Family. The Technical Working Group is chaired by Mr. Antonio Cinco; the Finance Committee is chaired by Tanauan Mayor Roque A. Tiu; the Committee on Invitation chair is Ms. Evelia Martin and the Publicity Committee is chaired by PIA Region 8 Director Olive Tiu. The other committee chairs are Hon. Neil Glova for the Documentation, Publicity, Postering and Streamers Committee; Mr. Antonio Cinco and Mr. Eugene Tan for the Festival Parade; and Mr. Antonio Chan for the General and Technical Services Committee. TACLOBAN CITY – June 9, 2010, Wednesday, is the last day of filing of Sworn Statements of Election Contributions and Expenditures by the candidates in the May 10, 2010 elections, pursuant to Section 14 of Republic Act 7166 and Comelec Resolution No. 8646. No person elected to any public office shall enter upon the duties of his office until he has filed the statement of all contributions and expenditures in connection with the election. Failure to file the statements or reports in connection with electoral contributions and expenditures as required shall constitute an administrative offense for which the offenders shall be liable to pay an administrative fine ranging from One thousand pesos (P1,000.00) to Thirty thousand pesos (P30,000.00), in the discretion of the Commission. The fine must be paid within thirty (30) days from receipt of notice of such failure; otherwise, it shall be enforceable by a writ of execution issued by the Commission against the properties of the offender. It is the duty of every city or municipal election registrar to advise in writing, by personal delivery or registered mail, within five (5) days from the date of election all candidates residing in his jurisdiction to comply with their obligation to file their statements of contributions and expenditures. For the commission of a second or subsequent offense under this section, the administrative fine shall be from Two thousand pesos (P2,000.00) to Sixty thousand pesos (P60,000.00), in the discretion of the Commission. In addition, the offender shall be subject to perpetual disqualification to hold public office. Meanwhile, the election period is up to June 09, 2010 and as such, the still enforced is the ban on bearing, carrying or transporting firearms or other deadly weapons in public places, buildings, street, park, private vehicle or public conveyance even if licensed to possess or carry the same, unless authorized by the Comelec. 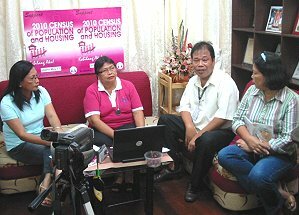 CATBALOGAN CITY – The National Statistics Office (NSO) in Samar appealed to the public to support the on-going census on population and housing (CPH). NSO-Samar head Letecia Chu (2nd from L) and senior statistician Romy Gabatbat (3rd from L) in a discussion about NSO census program with female TV hosts Emy Bonifacio and Ninfa Quirante of Issues Today TV Program during taping at the NSO office. NSO-Samar chief Letecia Chu and fellow personnel Romeo Gabatbat took turns in appealing to the public to welcome the enumerators in their homes and try to answer their questions honestly. In a taping of a special episode on “Issues Today”, hosted by Emy Bonifacio, to be aired over at Decobeam CATV in Catbalogan City and other towns in Samar, Chu aired her plea. “This is the 13th population and 6th housing survey,” she explained. As such, they have already deployed nearly 600 enumerators coming from the public schools and some supervisors all around the province of Samar. The 2010 CPH will be conducted to provide government planners, policy makers, and administrators with data on which to base their social and economic development plans and programs. Chu encouraged the barangay officials to assist them to locate some houses or families especially those in remote barangays. As it is, the office has met problems like teachers who became tired of the last elections backed-out as they were about to be deployed. Chu, however, assured the public that this problem has been addressed and that some participants were trained during the weekend and that some contingencies have been prepared should some more personnel feel indisposed. Questions which are sensitive like functional difficulties of the disabled are assured to be treated in utmost confidentiality, said Chu. Census enumerators will gather data through house-to-house visits and personal interview of the household head or any responsible member of the household. Similarly, institutional population living in institutional living quarters such as hospitals, sanitaria, penitentiary, military camps, convents, seminaries and others will also be visited by enumerators. In comparing population census data in the past, the general trend is an increase noted Chu. However, she explained that there are some areas where population is said to decrease, she stressed out-migration as the reason as residents tend to migrate to places where opportunities abound like Metro Manila and other urban areas. The NSO chief said that the census will usher development because the data will serve as benchmark in planning for schools, hospitals and other social services to be given in the whole country. CAMP APOLINARIO, Panacan, Davao City – A total of five Improvised Explosives Devices (IED) and three high powered firearms were recovered by government troops in two separate incidents in Davao region involving the New People’s Army (NPA). Elite soldiers from the 6th Scout Ranger Company on a mission to rescue four government troops abducted by NPAs clashed with about 40 armed abductors belonging to Local Terrorist Front-2 led by alias Benjie in the village of Panangan in Maco town in Compostela (ComVal) province 10:00 AM Tuesday. Soldiers were able to overrun an NPA encampment and recovered four IEDs, two M16 assault rifles and one M14 rifle following the clash. Maj. Gen. Carlos Holganza, commander of the Army’s 10th Infantry Division said that the rescue operation will continue. “We cannot and we will not leave our comrades in the hands of terrorists. We will do all we can to bring them back to their families who at present are suffering due to the criminal acts of the NPA. The NPA must follow the clamor of the people to free their hostages and cease from doing unlawful and violent acts.” Holganza said. “If there were wounded on their part, we hope that it is not fatal and that they may be given appropriate medical attention. A life lost either by the NPA or by government troops is a life lost by the Filipino people. If they think they cannot attend to their wounded, we are willing to extend help. It is better to surrender their wounded so that they may be given proper medical attention than letting them die in the mountains. Holganza added. It may be recalled that three soldiers and a Cafgu member were abducted in Mawab town a week ago while attending a birthday party of a three-year old son of one of the victims. The pleading wife and crying children of one of the victims did not deter the terrorists from mauling him infront of his family and poking guns at him and the rest of the victims. Meanwhile, another IED was recovered by troops of the 69th Infantry Battalion in the village of Mapula in Paquibato District in Davao City 7:00 AM on the same day. Authorities attribute the discovery of the IED to the vigilance of residents who informed soldiers on an object planted along the road which they suspect to be a bomb due to protruding wires. “The recovery of these IEDs is a welcome development as our people will be a lot safer from harm brought by bombs planted by NPAs on the roadside.” Said Maj. Gen. Holganza. The recovery of five bombs pegs the record to 23 IEDs recovered by troops in Region 11 for this year alone. In 2009, 11 IEDs were blown by NPAs in Davao region killing 10 government troops and a civilian while wounding another 28 government troops and two unarmed civilians. 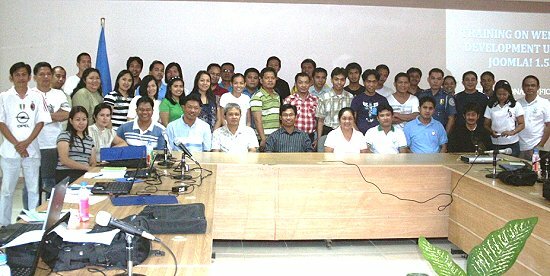 TACLOBAN CITY – The Department of Education in Region 8 is all set for this year’s Bridaga Eskwela or the National School Maintenance Week on May 24 to 28, 2010. DepEd 8 Assistant Regional Director Alberto Escobarte informed the Philippine Information Agency that the Brigada Regional Kick-off will be conducted at the Balangiga Central School in Balangiga, Eastern Samar and will proceed to Marabut, Samar. The Brigada Eskwela is a schools maintenance program nationwide that engages all education stakeholders to contribute their time, effort and resources in ensuring that all public schools are ready in time for school opening. It is an event where communities, parents, alumni, civic groups, local businesses, non-government organizations and private individuals including teacher and student volunteers to devote their time and skills to do repairs and maintenance work in public schools. ARD Escobarte said that the services that can be done in the schools are masonry, carpentry for the repair of chairs and furnitures, plumbing, electrical and electronic, landscaping and gardening for the beautification of the school. "It takes a community to educate a child and this is precisely the point of Brigada Eskwela, the voluntary participation of the community stakeholders for a better learning environment for our students," the good ARD said. During the Brigada Eskwela week, volunteers undertake the task of preparing the school in time for the start of classes in June. Minor maintenance work such as the repainting of the roof and exterior walls, repair of leaking water pipes, ceiling boards, broken furniture and windows, among others are done by volunteers with the help of donations in kind from non-government organizations and corporations. CATBALOGAN CITY – As the population census (POPCEN) 2010 starts yesterday, May 17, the National Statistics Office (NSO-Samar) has deployed some 550 enumerators and supervisors to cover all households of Samar province. In a talk with Samar’s NSO Provincial Statistics Officer, Letecia Chu, she said that most of these enumerators are public school teachers. “The census will be conducted from May 17 to June 12“, explained Chu. 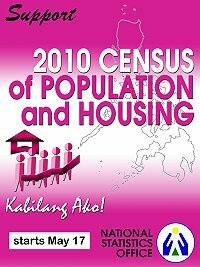 The last census done in 2007 recorded some 88.6 M Filipinos while 76.5 M Filipinos were reported in the year 2000. “The regular census is done every ten years but some LGUs request for mid-decade census to upgrade their Internal Revenue Allotment (IRA),” added the NSO chief in Samar. The census on population and housing (CPH) is designed to take an inventory of the total population and housing units in the country and collect information about their characteristics. The census also gave way to a Presidential Proclamation entitled “Declaring May, 2010 as National Census Month” to highlight the significance and importance of the census undertaking. In support, some government agencies hung some streamers announcing this important activity. Another support provided is the composition of the Regional, Provincial, City and Municipal Census Coordinating Boards to assist NSO. Census enumerators will gather the data through house-to-house visits and personal interview of the household head or any responsible member of the household. Similarly, institutional population living in institutional living quarters such as hospitals, sanitaria, penitentiary, military camps, convents, seminaries and others shall also be visited by the enumerators. Ms Chu is seeking the help of the media to disseminate the information to the public to gain support and cooperation from the target population. BORONGAN CITY – Attorney Butz Beato, Commission on Elections (COMELEC) Provincial Supervisor proclaimed Ben Evardone, as the newly elected Representative of the Lone District of Eastern Samar at about 2:00 o’clock in the morning of May 12. Evardone who currently sits as the provincial governor (2nd term) garnered a total of 74,045 votes against his close rival, re-electionist Teodulo Coquilla who gathered 64,122 votes. “Thank you very much for your support,” were the words Evardone could only muster as he shook hands and stepped out of the SP Session Hall after his proclamation. Minutes after, Conrado “Aklan” Nicart Sr. was likewise proclaimed as the duly elected governor with a total of 46,303 votes against Guiuan’s Generoso Yu who harvested some 42,044 votes. Nicart who is familiar also with his signature beard and mustache, displayed a comical amazement, as he marched inside towards the hall for COMELEC’s readings of his victory. “Dire naman dawla in barangay hall?”, (This is no longer just a barangay hall) uttered Nicart as he expressed difference of his previous political physical environment. A former member of the Philippine Constabulary (PC) Nicart reigned in years as San Policarpo town mayor; recently he entered the provincial race and destiny was his to successfully hit the mark over and above his rivals. He was followed in the center stage, by Christopher “Sheen” Gonzales as the youngest ever elected vice-governor with a whooping 101,424 votes against Atty. Jovy Opinion who collected some 44,995 votes. Opinion currently holds a board member seat at the Sangguniang Panlalawigan. The tall, good-looking and young vice-governor elect was accompanied to the provincial canvassing by Bureau of Immigration (BID) Commissioner Marcelino Libanan with wife Elda, who are his parents-in-law. Earlier of the same evening, at the City Canvassing Office, Atty. Raymond Gunda, City Election Officer, proclaimed Ma. Fe Abunda as the new Borongan City mayor with 12,542 votes with Fidel V. Anacta Jr. as vice mayor with 13,200 votes. Abunda and Anacta are the current vice mayor and mayor respectively. It can be recalled that Abunda, daughter of erstwhile vice-mayor Lesing Abunda was earlier branded as an undiplomatic, hard hitting woman, but brother Boy Abunda came to defend her when he talked to the media. “Mas maupay nala it, it maisog kontra hit makawat,” (Better to be hard hitting than be a theft,”) said the younger Abunda in a previous press conference. 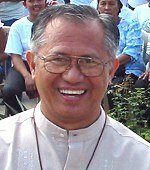 TACLOBAN CITY – Archbishop Jose S. Palma of the Archdiocese of Palo, who is the vice chairman of the Catholic Bishops Conference of the Philippines (CBCP), called on the newly-elected officials to leave a legacy of good service. He also expressed hope that the newly-elected officials will indeed respond to the issues of poverty and corruption which are besetting the country nowadays. In an interview with the Hatol ng Bayan PIA 8 Remote Hub which was viewed at the government television stations like National Broadcasting Company, RPN9 and IBC 13, Archbishop Palma also urged the public to cooperate with and pray hard for all the new political leaders so that the just-concluded elections will truly become an opportunity for the change the country is hoping for. The PPCRV will continue its watch on the elected officials in order to ensure and to remind them of their election promises, Archbishop Palma said even as he called on the people to do the same. The Archbishop expressed his joy and contentment on the successful holding of the first automated elections in the country on May 10. Archbishop Palma lauded the voters who showed their eagerness to exercise their right to vote. He said that the voters stayed to wait for their turn to vote despite the heat of the scorching sun and the long wait because of long queue. He also cited the important and heroic role played by the PPCRV volunteers, the members of the Philippine National Police in Region 8, the military, the teachers and the Comelec officials, for the orderly and peaceful conduct of elections. The Parish Pastoral Council for Responsible Voting (PPCRV) has been working assiduously for Clean, Honest, Accurate, Meaningful and Peaceful elections. It has done so, and continues to do so without the usual fanfare or clanging cymbals and noisy gongs. TACLOBAN CITY – In line with the intensified forest protection efforts of the Department of Environment and Natural Resources, Region 8, the Quick Reaction Team of the CENR Office in Palo, Leyte recently apprehended 31 pieces of red lauaan lumber totaling 677 board feet with an estimated value of P23,695 pesos. In a report of CENR Officer Marciano Talavera of CENRO Palo, the Quick Reaction Team headed by Forester Ricarte Cabling apprehended the five motorcycles loaded with the contraband lumber in Poblacion Zone II, Capoocan, Leyte on April 14, 2010. The alleged perpetrators include RicRic Sebalante and two others from Brgy. Balucanad, Capoocan, Leyte; Ricardo Cordel and Angelo Liansa from Barangay Caghalo, Carigara, Leyte and Federico Dolebte of Brgy. Barayong, Carigara, Leyte. The six perpetrators were immediately detained at the PNP lock up cell in Carigara, Leyte. They were only release after they have filed a bond for their temporary liberty. Criminal complaints were immediately filed against the said perpetrators at the Carigara Regional Trial Court for violation of P.D. 705 as amended and renumbered by R.A. 7161. The DENR also coordinated with the Land Transportation Office for the identification of one of the five motorcycles without plate number. Regional Executive Director Primitivo C. Galinato, Jr. of the DENR created Quick Reaction Teams in the different field offices of the DENR. These Quick Reaction Teams conduct forest protection activities especially in areas identified as hot spots for illegal logging. This is part of the DENR’s program direction “From the Ridges to the Reefs” wherein the upland areas specifically the forests is given full protection, it being the mother of all ecosystems. TACLOBAN CITY – To enhance the skills of the Regional Development Council (RDC) member-agency webmasters on website development and updating, the RDC through the Eastern Visayas Information Sharing Network (EVISNET) conducted recently a three-day training on Website Development using Joomla 1.5. Joomla is a Web Content Management System which enables one to build websites and powerful online applications through simple text, photos, music, videos, documents, among others. Teresita I. Escobar, NEDA Supervising Economic Development Specialist and EVISNET Manager said that the training used Joomla 1.5 CMS as it is more advanced and beautiful, easier to handle, provides more support and user-friendly compared to Joomla 1.0 which the RDC members website are using now. Escobar said that migration from Joomla 1.0 to Joomla 1.5 will pave the way to a more beautifully-designed and even world class websites with competitive ICT content that will provide the service needs of the public. Likewise, the said training was done in preparation for the forthcoming search for the Best RDC Website Contest which will be conducted in July this year, Escobar said. Topics discussed and applied during the workshop includes installation of Joomla 1.5; installing and customizing templates, modules, components; populating website; and editing photos using fireworks, among others, through the brilliant I.T. know-how of Peter Philip Pates, the workshop trainer supported by the EVISNET team. One of the highlights of the activity was the presentation of the output by agency where the EVISNET Manager expressed her gladness as she was impressed of the beautiful websites that were designed by the more than 40 participants. Escobar also expressed her appreciation to the participant’s interest to learn as manifested in their participation leaving no time wasted.